Bioabsorbable Vascular Scaffolds (BVS) are made from synthetic polymers that have been specifically produced for safe use in the human body. Many patients who are eligible for the regular cardiac stent are also eligible for the new BVS technology. Until more experience with this technology is obtained, certain subsets of patients are currently deemed unsuitable for this new breakthrough in treating coronary artery disease. These include those with extensive calcified blockages and blockages at the side of branches that come off the main vessels. Despite being very successful alternatives to coronary surgery, coronary stenting still carries small risks. When balloon angioplasty (without stents) was initially introduced in the 1980s, doctors began to realise how treated blood vessels were likely to become narrowed again as an inflammatory response to the procedure (restenosis). This occurred in 50 per cent of treated vessels. In the 1990s, with the introduction of bare metal stents at the treated area (cardiac stenting) to provide a permanent scaffold to hold the artery open, things began to look better as the number of patients experiencing restenosis or re-narrowing after the procedure began to decline. This occurred initially in up to 30 per cent of treated vessels and reduced to less than 20 per cent as the technology improved. However, the stents were not a sure-fire solution, as the medical world has found out today. Metal stents can be prone to blood clotting due to the presence of a foreign object in the body. These patients will always be at risk of the stents suddenly closing if they stop their blood thinning medication (e.g. Aspirin, Plavix) for prolonged periods of time, as might be needed prior to major surgery. In addition, the stents made the arteries permanently less flexible. Open heart surgery, or Coronary Artery Bypass Grafts (CABG), usually involves a cut in the central chest bone to address blocks in multiple arteries and where stenting is not advisable. The blockages are “bypassed” by creating an alternative route for flow by utilising veins from the legs or arteries from the inside of the chest, i.e. the Left Internal Mammary Artery (LIMA) or other arteries from the forearm. No permanent metal stent is left inside the body, but studies have shown that 50 per cent of vein grafts taken from the legs are blocked at 10 years. The best results are seen with the LIMA grafts, but 10 per cent of these are also blocked at 10 years and there is only one of these available for use in the human body. Therefore, the other arteries will always have a higher risk of restenosis and this is not the perfect solution either. 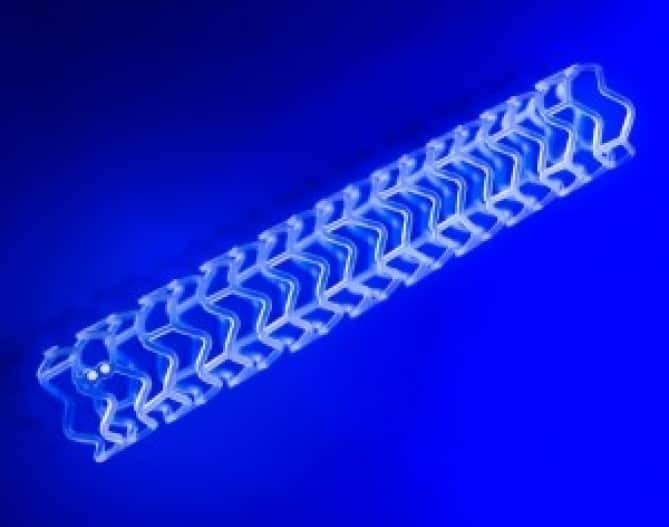 Doctors and scientists responded with drug-eluting stents (DES) in the new millennium, addressing the issue of restenosis with a drug that inhibits cell growth on the implant. DES were effective in further decreasing the chances of restenosis and blood clotting to 5 to 10 per cent. The number of CABG world-wide were reduced with the widespread use of these stents, as this was considered a very low risk, even in cases where there were multiple “blockages”. Nevertheless, the issue of the permanent implant remained. But now, there might be a possibility to finally overcome some of these barriers with the introduction of BVS. The synthetic material, which BVS is made of, happens to be biodegradable; meaning it will slowly dissolve into natural chemicals, leaving nothing behind in the treated area after two years. This allows full healing of the affected area in time, allowing the vessel to revert to its natural state, removing some of the risks associated with a permanent implant. With that said, this technology is still in its infancy, and cannot be used for all patients. To date, we only have follow-up data up to four years. Nevertheless, it provides a viable alternative for those who are not comfortable with the idea of a permanent metal implant in their heart. DES, on the other hand, have been proven and tested for more than ten years with restenosis rates for the newer stents generally quoted at less than 5 per cent for one’s lifetime, and are therefore here to stay unless the new BVS technology proves itself over time. What risks does it bring?